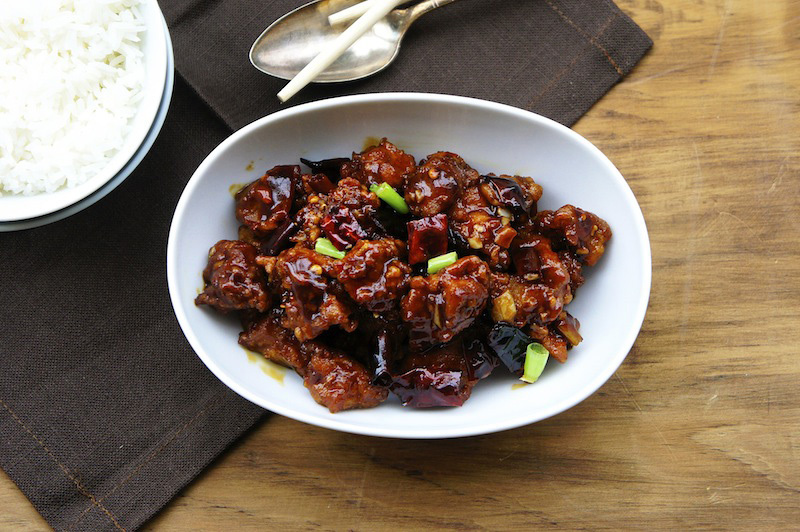 General Tso's chicken is one of North America's favorite Chinese-takeaway dishes. It's also a really easy dish to whip up at home when you feel like skipping your local Chinese restaurant. Do try making it using this recipe when you get the chance. It's a much tastier and healthier option as well. You can always adjust the sweetness and spiciness level to suit your palate and personal preference. Return the wok to a high flame with 2 Tbsp of the oil. Add the dried chilies and stir-fry briefly until they are fragrant and just changing color (do not burn them). Toss in the ginger and garlic, stir-fry for a few seconds more, then add the sauce, stirring as it thickens. Tip in the chicken and stir vigorously to coat it in sauce. Add the scallions and stir a few times, then, switch off the heat, stir in the sesame oil and serve. Thanks for dropping by, do try some of the recipes too. Hi Esther, you should try to make this dish at home. Yes, it's similar to Kung Pao's chicken, like you said without the cashew nuts, and Sichuan peppercorns too. Oh my goodness this sounds fabulous and looks it too! Thanks for the comment, and do try the recipes. Sounds fantastic and I bet it taste fantastic too. What's missing is a bowl of plain rice! Yes, the chicken tasted great with steamed rice. I made this for dinner last night, and it was a hit! Absolutely delicious. I'm glad it turned out great for you, and thanks for the feedback. I made this the other night with my boyfriend, and we were really pleased with the results. Not only was the recipe was surprisingly simple to make and delicious to eat, but the dish looked beautiful plated over rice and served with sake.